This leaflet has been produced to give you advice about a condition known as lymphoedema. It can be used in conjunction with the information you will already have been given by your Lymphoedema Nurse Specialist. The leaflet will help you manage your lymphoedema following your initial assessment. Most of your questions should have been answered at your initial assessment, if however after reading this leaflet you have any concerns or require further explanation, please contact your Lymphoedema Nurse Specialist. People with lymphoedema have a high risk of developing an infection due to their impaired lymphatic system. One of the most common infections is called cellulitis, which will appear in your affected area. You will need to see your GP immediately to assess if antibiotics are required. Until symptoms have improved, it will be necessary to remove your compression garment (see below) and rest your leg. Please inform your Lymphoedema Nurse Specialist after you have seen your GP. Repeated attacks of cellulitis will cause further damage to the lymphatics and may result in an increase of swelling. It is important to try to reduce the risk of cellulitis by taking very good care of your skin. Avoid breaks in the skin. Use a non perfumed moisture cream to keep your skin supple and in good condition. Apply the cream daily, best done at night after your bath/shower. Apply cream in an upwards direction, starting at the top of the leg, finishing at the foot. Smooth down the hairs on the leg so that they lie naturally flat. Inspect your skin daily, looking for signs of broken areas, redness and swelling. Pay particular attention to feet and toes. Protect the skin on the leg from sunburn. Use an electric razor if and when shaving the leg. Dry well between the toes after a bath to prevent fungal infections such as athletes foot; be sure to get treatment for this if it appears. Take care when cutting toe nails; cuts from nail scissors may become infected. It is best to use nail clippers. Do not allow injections to be given in the affected leg/buttock. When relaxing, elevate your legs on a foot stool. Avoid standing for long periods if your legs are swollen, either walk around or sit with legs elevated. Please ensure you are wearing your compression garment when exercising, if you have been supplied with one. 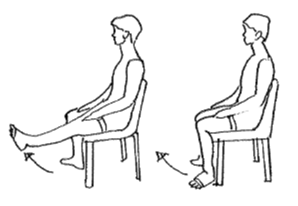 If your mobility or balance is affected, exercises can be done whilst sitting on a chair or in bed. f the exercises cause you pain or dizziness, discontinue until you have contacted your Lymphoedema Nurse Specialist. 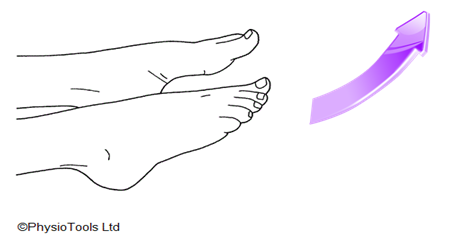 If you have cellulitis you should rest your affected limb and carry out very gentle movement, e.g. bending of the knee and ankle. Try to exercise every day; swimming, walking and yoga are good forms of exercise. 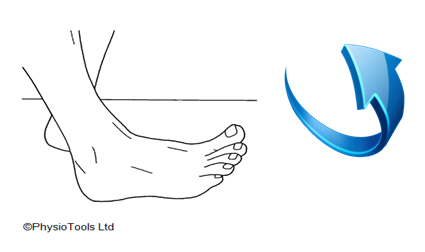 Exercising your leg whilst carrying out normal day to day activities will help to manage your swelling. Exercises should be gentle, keeping the joints moving and in good condition (ankle, knee and hip). 1. Slowly circle your foot at the ankle. 2. Slowly bend your foot at the ankle, bringing your toes towards the knee. You should feel a stretch at the back of your knee; hold for a count of five seconds and then slowly point the toes down to stretch the ankle. Hold this position for five seconds. 3. Either sitting on a chair or on the side of your bed, bend your knee as far as you can and then stretch your leg out straight in front of you. Try to work the muscles at the front of your thigh so that they feel firm. Hold for a count of 10 and then relax for a count of 10 before starting again. The garment should not be too tight. It should feel firm and supportive but should not be painful or make the toes turn a purple/blue colour. Ensure the garment is not too loose or baggy, especially nearer the foot, otherwise it will not do its job. If the compression garment feels too long, just ease the excess material evenly down the limb. If you experience pins and needles, loss of sensation anywhere in the limb that you have not experienced before, an increase in pain, or if your toes turn blue, you should remove your garment immediately and inform your Lymphoedema Nurse Specialist.